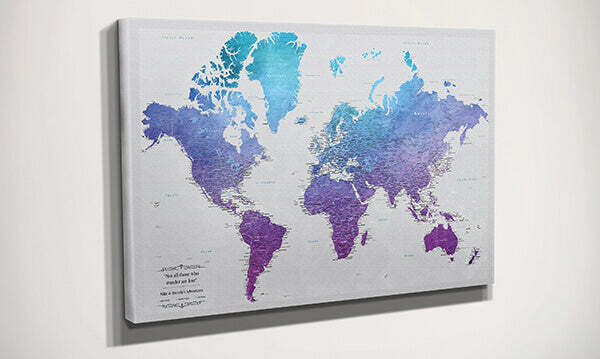 Vivacious and Vivid are just two words to describe our Vibrant Violet Canvas World Wall Map! This gallery wrapped watercolor travel map of the world has a striking design in shades of blue and purple. The soft grey background color of the oceans coupled with the rich textured finish of the canvas and modern gallery wrapped design will ensure the beauty of the continental colors pops right off the wall. 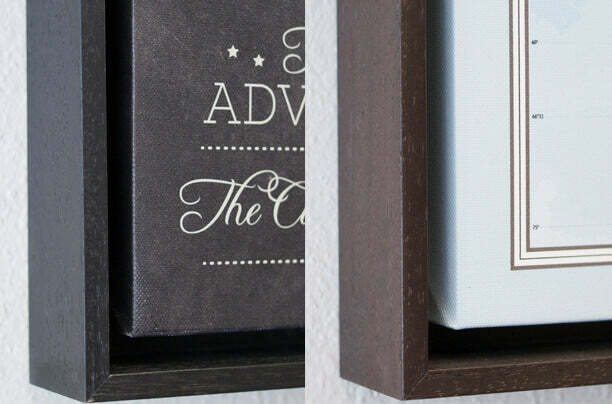 Track and display your worldly travels on this interactive work of art for your home or office. This one of a kind canvas world wall map is one of our more detailed designs. All 50 US states are labeled and outlined and country capitals are highlighted with a star. Antarctica has been removed from this travel map in order to create the most amount of pinnable space. Inspire future travel adventures for yourself and your entire family with this gallery wrapped canvas map with pins. A gallery wrapped canvas map makes a fun and unique gift idea for your wanderlust stricken loved ones! You were easy and awesome with answering questions right away. The map also looks great! This map symbolizes the beginning of wonderful adventures. I’m to start pinning my adventures on this beautiful map. Thank you! I absolutely love the map we got. It's exactly as pictured, the pins work great, and delivery was fast! Mike and Brenda were quick to respond to my questions. We looked at lots of sites and we got the perfect map here! My daughter is graduating high school and off to college in a few months. I’m sure she has many great adventures ahead of her and a since she means the ‘world’ to me, I thought this would be a great gift. I was right! She loves it! I looked at many other maps online, but when I saw that this was on canvas instead of framed, it will be easy to transport through years of moves. It is a quality product, and the personalization is a nice touch And my daughter loves the colors, too! Thanks. I highly recommend this map.